Seed packets and seed starting supplies are beginning to pile up around my house. Soon there will be hundreds of little plants in sunny window sills and sprouting under grow lights. I’m already anxious for spring, but know that I need to wait until the right time to get started. After doing an inventory of seeds, and ordering what I want for this year, it’s time to plan my seed sowing calendar. When preparing to sow seeds, you need to start at the end by thinking of when it’s safe to plant them outside. Our frost free date here in Mid-Michigan is about May 13th. This is a good time to plant most vegetables and flowers outside without worrying about the dangers of frost. Eggplant, peppers and basil don’t do well in cool soils or air temperatures. I have had better luck waiting until Memorial Day weekend to plant those outside. Or, you could use season extension techniques which I will talk about closer to planting time. What about cooler season crops? Spinach, arugula, lettuce, beets, peas, carrots, broccoli, cauliflower, onions, chives, cilantro and violas are just a few that can be planted outside in April, about the first or second week. So, should you start sowing all the seeds you have right now? How to you figure out what to sow when? First things first. Get a calendar. A really big one that you can write all over and see every day. Or, if you prefer, a planner type calendar, or a spread sheet. Whatever works best for you. Mark your first frost free date. That is going to be your starting point. You can also add something like, “Plant Cool Season Crops” on a day in the first two weeks of April, and then around Memorial Day, “Plant Warm Season Crops” so you know when to plant out eggplant, peppers and basil. I am going to use tomatoes as an example to get you started. When you look at the cultural information for tomatoes, typically it will say start indoors 6-8 weeks before last frost. Starting on the calendar at May 13, you will count backwards 6-8 weeks. So any time between March 18th and April 1st would be an ideal time to start your tomato seeds indoors. Continue to do this with everything you are going to grow. Some seeds, such as beans or nasturtium do best planted directly in the garden so don’t start them indoors. 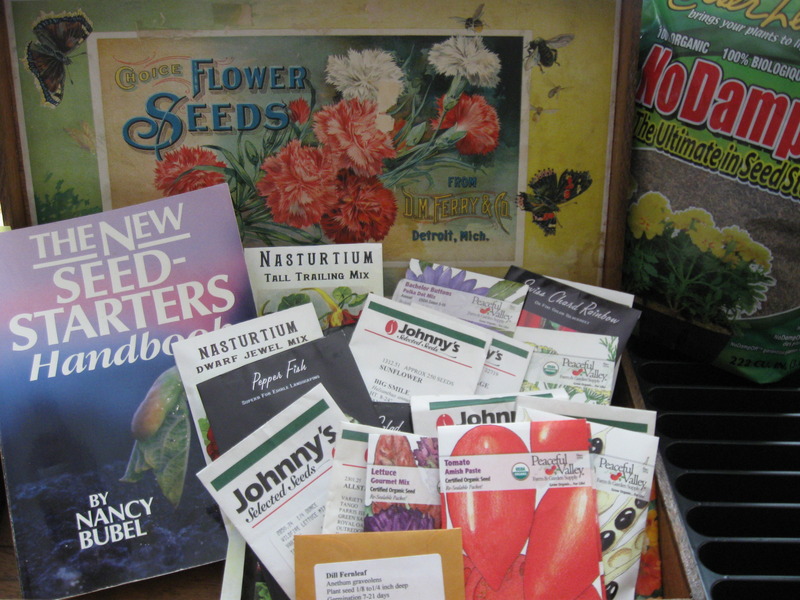 Follow directions from your seed supplier, or better yet, get the book The Seed Starters Handbook by Nancy Bubel. She covers in detail everything you need to know about seeds. A must have resource for every Urban Farmscaper. As you continue to work on your seed sowing calendar, you will probably start to notice that, with a few exceptions, most seeds will need to be started in March. Some cool season crops such as broccoli will be started at the end of February. Your calendar will also serve as your planting calendar and a record for future years, so take good notes. You should start shopping around for seed starting supplies such as “No Damp Off” seed starting mix by Mosser Lee, Heat Mats, Seeding Trays (like the 20 row seeder available at Johnny’s Selected Seeds) and full spectrum fluorescent lights. Soon I will be sharing with you my tips and tricks for success as I start sowing my seeds. ← Is it the Seed or the Plant? Patti, thanks for the reminder to think about my summer garden!